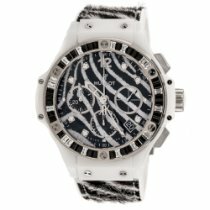 Hublot Big Bang Zebra Bang 41mm Ladies ) 18K rose gold case with brushed & polished finishes. Solid 18K rose gold bezel. Secured by 6 polished "H" shaped titanium screws. Set with 48 precious baguette cut stones (stones: black spinels & uncolored topazes) Case center (edge) lateral black composite resin inserts. Rose gold crown & chronograph buttons with black rubber centers/inserts. Black & white "ZEBRA" design dial. Hour markers: 8 applied diamond hour markers, the 12 o'clock marker is "applique" applied rose gold-toned Arabic Numbers & small rose gold-toned indexes at the 3, 6 & 9 o'clock position Brushed finished skeletonized rose gold-toned hands. Gold printed minute track with 5-minute Arabic numerals intervals on the dial edge. Chronograph stopwatch functions: Large central seconds counter with the "H" logo as a counter-weight. 30 minute sub-dial counter located at the 9 o'clock position. 12 hour sub-dial counter located at the 6 o'clock position. Small running seconds sub-dial hand located at the 3 o'clock position. Date window located at the 4 & 5 o'clock position. Black & white "ZEBRA" design calf-skin strap with black rubber edging & backing. Hublot Caliber HUB 4300, beats at 28,800 vph, composed out of 278 parts, contains 37 Jewels & has an approximate power reserve of 42 hours. The watch new with papers, box, and warranty.